Chiru’s Condition, Will Pawan Accept? Why Megastar Chiranjeevi was silent for all these years? Why he is keeping himself away from politics? Did he resign to Congress Party? Which Party he will support in the next elections? Will he contest in the next elections? These are the questions being raised by fans as well political analysts. De facto, Chiranjeevi is not active in politics for last few years. He is neither participating in any political campaigns nor is he attending party meetings. He didn’t even respond to the rumors of quitting Congress Party. Political analysts predict that, although Chiranjeevi is willing to join Power Star Pawan Kalyan floated Janasena Party; he is waiting for a call from his younger brother. In fact, one section of Janasena activists is suggesting Pawan Kalyan should take help of Chiranjeevi to strengthen the party. They opine joining of Chiru in JSP will help the party to have maximum of support from Kapu community. On the other hand, Chiranjeevi will not have political growth if he stays with Congress Party which will not win even decent numbers of seats in next elections. The main fight will be between TDP, JSP, YSRCP and Congress will be restricted for fourth position. So, if Chiru wants to continue in politics, he has only option that he needs to join JSP. But, he will wait until he gets a call from Pawan Kalyan who once opposed his brother’s decision of merging Praja Rajyam Party with Congress. Meanwhile, Pawan Kalyan’s elder brother Nagababu is also keen to contest in the next elections and he is expected to campaign for the party just a month before the elections. 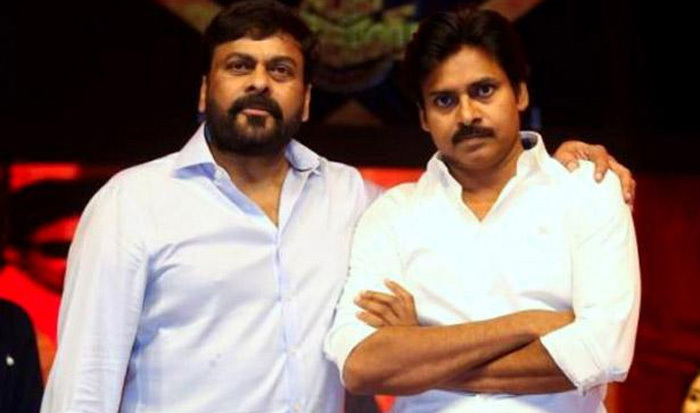 He is indeed said to be mediating between Pawan Kalyan and Chiranjeevi. If things go well, Chiru would join JSP soon. However, as per inner sources, Chiranjeevi will make his decision if and only if he gets invitation from Pawan Kalyan or else he will keep away from politics for some more time. It has to be seen what Pawan Kalyan will conclude on this!